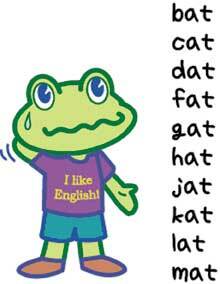 Phonics refers to a method of teaching speakers to read and write a particular language. Phonics involves teaching children how to connect the sounds of spoken language to letters or groups of letters (For instance, in English the sound /k/ can be represented by c, k, ck or ch spellings) and to blend the sounds of letters together to produce approximately correct pronunciations of unknown words. Learning the phonetics of a language helps one to speak it properly. On the surface, English seems easy when compared to other languages, after all it has only 26 letters. However, these 26 letters can produce 42 different sounds. Although there are only five vowels, there are 20 different vowel sounds and 24 consonant sounds. Not surprisingly, this causes difficulties for learners. One problem for pupils is that a single sound may be written in many different ways, and conversely a single letter may possess several different sounds. Unless pupils are aware of these features of English, they will find it difficult to pronounce words. The author is a teacher at the Calorx Teachers’ University. She can be reached atratnar_p@yahoo.co.in.